We Won't Shrink Your Giant Teddy Bear. Get Guaranteed BIG BOX Delivery. BigPlush.com Does NOT and Will NOT Shrink Wrap or Vacuum Seal ANY Big Stuffed Anmal That You Order from us. 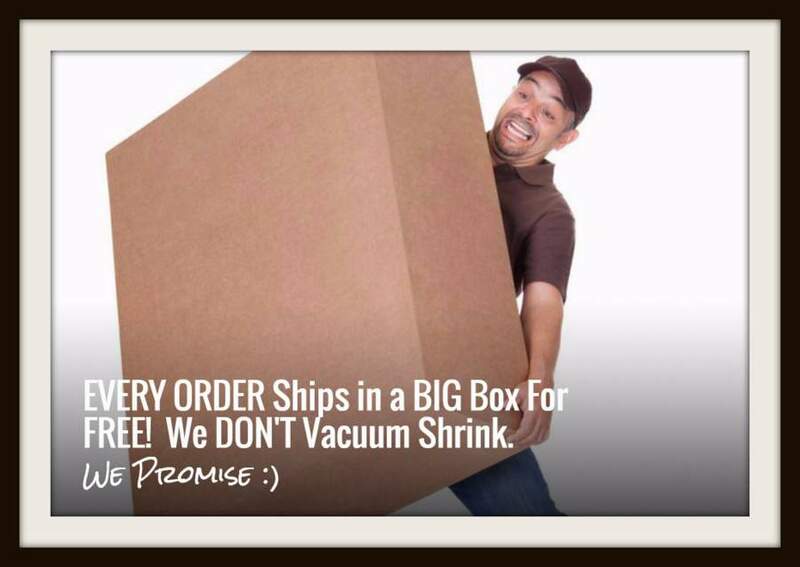 That's our "BIG BOX DELIVERY GUARANTEE"
Did You Know That Some Companies Try to Save Money on Shipping by Shrink Wrapping Their Giant Stuffed Animals Before Shipping Them to You or Your Gift Receipient? They do this by crushing almost all of the air out of the stuffed animal by using industrial strength high-pressure vacuum sealers. Yes, we suppose this enables them to ship your "Giant" teddy bear in a Tiny box, which saves them a ton of cash with UPS and Fedex. And yes, we suppose the poor old stuffed animal will probably end up okay at the end of it's trip after you or your gift receipient pry the poor old creature out of it's oxygen deprived tomb and do some human to giant teddy bear recussitation and first aid. But we wonder, why should you have to go through this? And more importantly... WHY should you put your dear gift receipient through this? 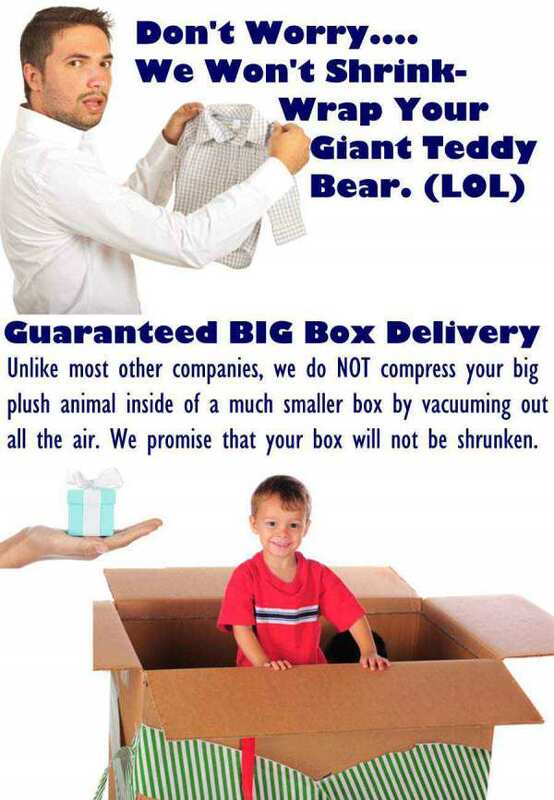 Here at BigPlush.com, you'll never have to worry about your GIANT Stuffed Animal arriving in a SMALL Box. We guarantee a BIG BOX DELIVERY first time, second time and EVERY Time! So let's hear it for being humane to all giant stuffed animals. Big Stuffed Animals deserve BIG Delivery Boxes. BIG Delivery Boxes get BIGGER Smiles. 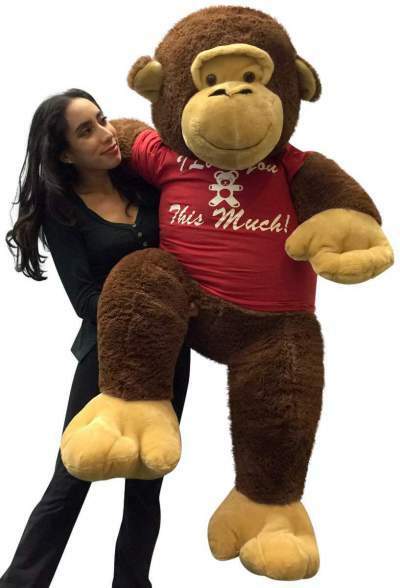 Get YOUR giant stuffed animal from BigPlush.com, and make the big stuffed animal as happy as the person you're giving it too!